My favourite thing about my little trip to Brussels? The food. Turns out that the Beligians really do like eating. And the same sort of foods that I love in fact. Excellent. 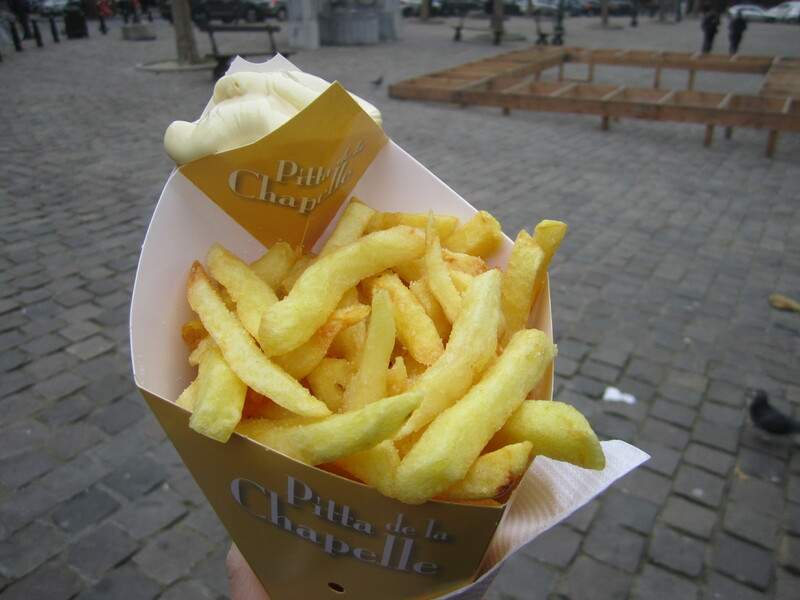 Chips– vlaamsefrits. Mmm. My favourite thing to eat in Amsterdam is chips from a takeaway vendor, and Brussels provided chips that were just as good. I don’t know what it is about chips in the Low Countries, but eating chips with mayonnaise was never as satisfying as when eaten piping hot out of a paper cone! The ones above even had a special compartment for your sauce- that is dedication. Mussels– beautiful. Even having had a really, really hideous bout of shellfish food-poisioning in the past, nothing puts me off eating mussels. In a steaming hot pan, accompanied by chips, crusty bread and a garlicky, white wine, creamy, oniony sauce. Food heaven. I think this may be my favourite meal ever. Waffles– now, these I wasn’t so impressed by. I wasn’t overly keen on the idea, but since we were in Belgium, having a Belgian waffle for an afternoon pick-me-up seemed a must. I had mine with a dense, bitter chocolate sauce accompanied by a chocolat chaud. It was ok, but not sure I’d bother again- give me a crepe instead any day. Chocolate– Belgium and food cannot be mentioned together in a sentence without also mentioning chocolate, non? Fear not, I have a post coming up specifically on this very subject so keep your eyes peeled. Beer– again, a Belgian staple. I was astounded by the array of Beers available- imagine anything and it’s probably been done. My favourites are the fruit lambics, but Chris prefers a Trappist trippel. We even tried the Brussels specialty of Gueze (brewed only with the natural yeasts present in Brussels air) but this was not a winner for either of us!